What Foundations are Built Across the Nation? 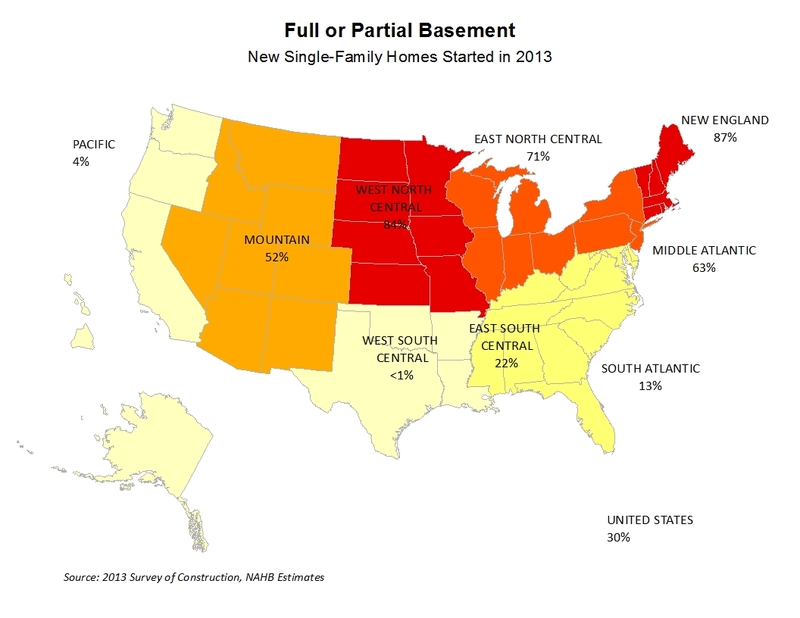 NAHB analysis of the Survey of Construction (SOC) data shows that nationally, about 30 percent of new single-family homes started in 2013 have a full or partial basement, 54 percent are built on slabs, and 15 percent have a crawl space. The remaining share, including homes built on stilts or pilings, accounted for about 1 percent of homes started in 2013. The national averages, however, mask the substantial regional differences in foundations reported in the SOC. The SOC which is conducted by the US Census Bureau and partially funded by the Department of Housing and Urban Development (HUD) collects detailed information on physical and financial characteristics of newly-built single-family homes. The information comes from interviews of builders or owners of the selected new houses. About 1 in 50 new single-family homes are selected for interviews based on a sample of building permits and a canvassing of areas not requiring permits. This sample is large enough to provide estimates for nine Census divisions. The wide regional differences in foundations can largely be explained by climate. In colder regions where codes require foundations to be deep the marginal cost of providing a full or partial basement is not that great. So basements are the most common type of foundation in the colder climate divisions. 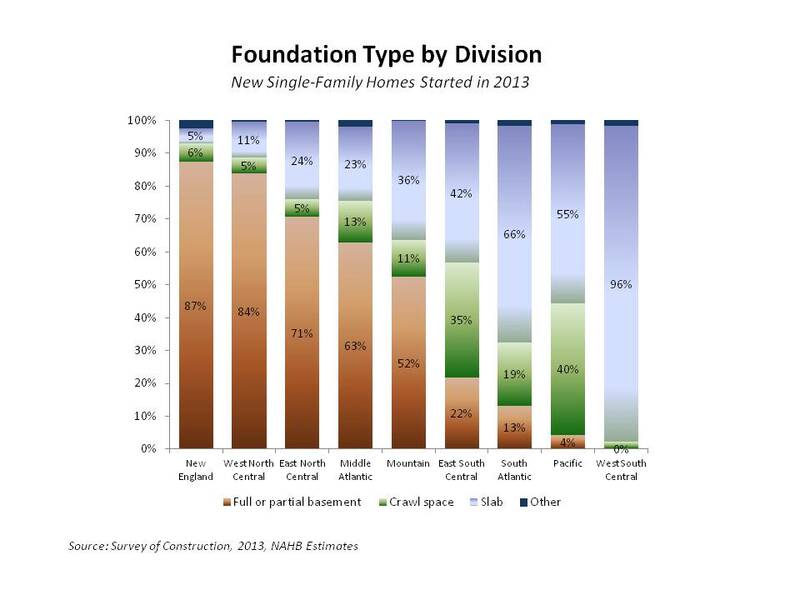 In New England, 87 percent of new single-family homes started in 2013 have basements. This share is similarly high in the two divisions that make up Midwest – West North Central and East North Central – where the shares of new single-family homes with basements are 84 and 71 percent, respectively. In the neighboring Middle Atlantic division, the majority of homes are still built with basements, 63 percent. In the warm West South Central division almost all single-family homes are built on slabs. Homes started in the other two divisions that make up the South region – the East South Central and South Atlantic –are still largely built on slabs but crawl spaces are also common. In the Pacific Division about 55 percent of homes started are built on slabs and crawl spaces account for additional 40 percent of single-family starts, the highest share in the nation. The Mountain division that stretches from northern Idaho and Montana to southern Arizona and New Mexico reports a wider mix of foundations, with about half of new single-family homes built with basements, 36 percent built on slabs, and additional 11 percent reporting a crawl space. ‹ Where is the Custom Home Market Share Highest?